The world needs your votes and ideas. Do it for nature, for your community and for yourself. Become a DominoOne! Join Efforts That Matter Most to You. Prioritize What Gets Solved Next. Change the World with Your Ideas and Votes. Share and Fund the Best Solutions. Please take a moment to update this very important information for your account. By proceeding you agree to our terms and conditions. Whoops! This one is private. Apply today and wait for the Admin's approval then you’ll have full power to vote, share and suggest! We noticed you’re not registered with this host organization. Simply click “Join” below and you’ll be added to their list. 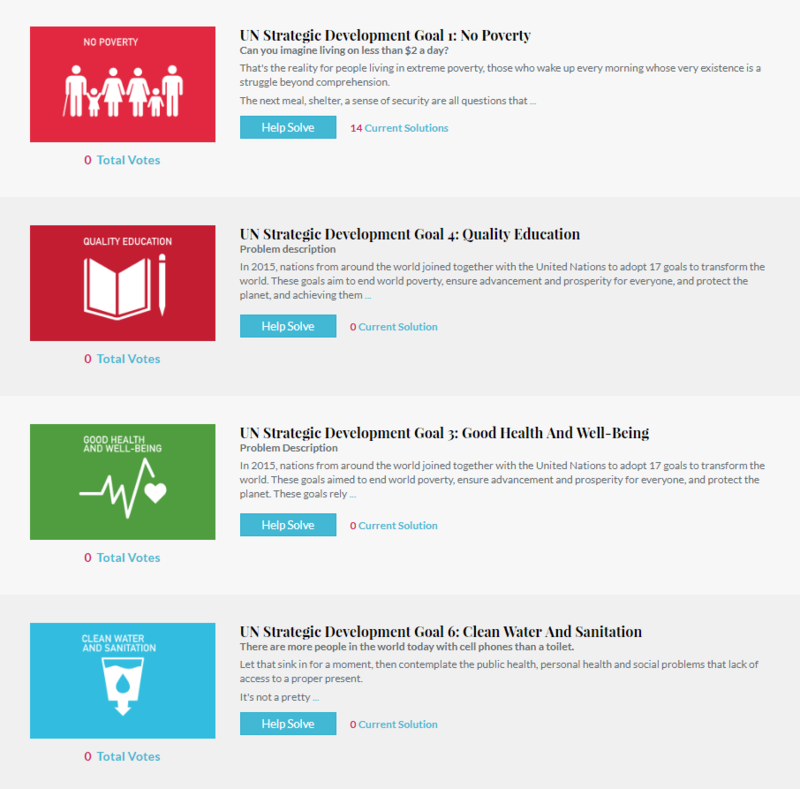 You are now a member of the "United Nations Strategic Goals" Group. Thank you for joining DominoOne! The new few screens will show you how you can change the world. Simply look for groups to join. If you don’t find one you’re looking for, be the first to invite them and earn our prestigious DominoOne badge! Once you join a group, you can vote issues up or down depending on what you think is most important to solve! Just keep your eye on the clock. 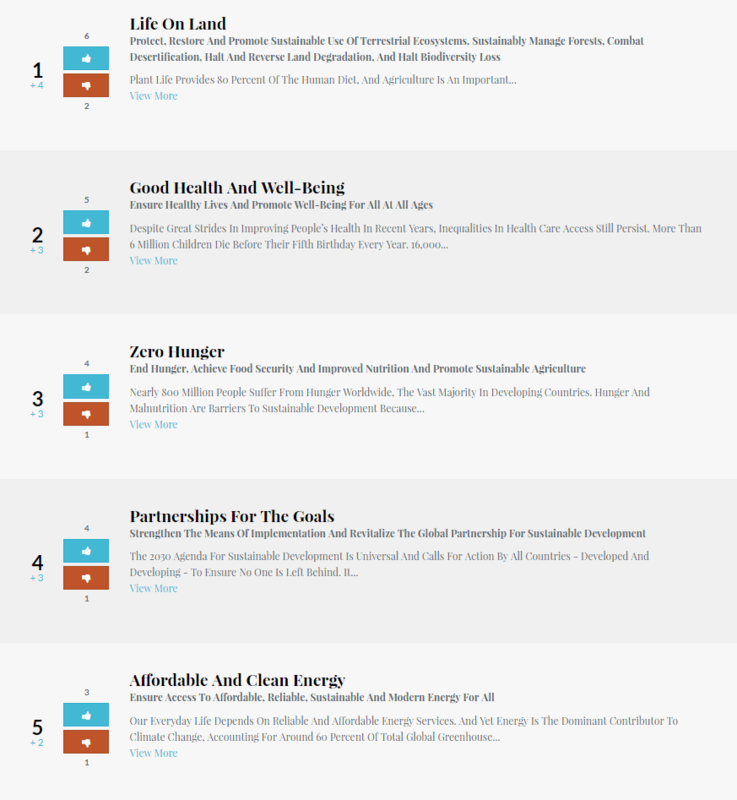 The top issues from the previous session are now ready to be reviewed and solved. The organization will have suggested ways to solve them. Now you can vote them up or down, improve them or provide totally new ways to accomplish the goal! Once solved, the organization will provide a final solution set. In some cases, additional funding may be needed. You can help spread the word and donate through funding links to make that solution a reality. And... each share and donation increases your Humanity Score! and earns you valuable points and badges. This is where change happens. Your voice. Your vote. Your ideas. On behalf of humanity – THANK YOU. This is what you’ve been waiting for. A platform that receives constant engagement participation from your member base, helps you achieve your mission faster and then funds those initiatives so that you can have a greater impact. It also can help you recruit new already-sympathetic members with exposure inside of a greater ecosystem. We understand you’re charged with the responsibility to deploy resources in order to deliver a maximum positive impact and more social good for nature and humanity. We also understand the competition for active members, donations and sponsors is at an all-time high. Drive More Engagement. Year Round. Deliver More Volunteers and Funding. DominoOne will accelerate your mission and unite your community. Find out if your organization qualifies to receive a FREE DominoOne platform today! Find out if you qualify for a FREE DominOne platform! Refer an Organization to us and become a DominoOne! You’ve successfully registered your account and we can’t wait to see how you change our world. The final step is verification so we know you are you! 1. We’ve sent you a verification email to the email address you provided. If you didn’t get it, please click here. 2. Once received, click on the link in that email and it will open up a new browser window asking for a special code. 3. We also sent you a one-time text message with that code. 4. Simply type that code into the newly opened browser window and that’s it. We suggest you keep this window open until all of the steps have been complete. vote, suggest, improve and share ideas that improve our world! Did You Received any Welcome SMS from DominoOne? Hi! Suggest a New Issue for us to consider! * We'll review and get back to you after submission. You have been temporarily blocked from performing this action. Please allow our admin to review and verify your reported post. We will update you soon. Each member is only allowed five (5) up votes and five (5) down votes to set priorities. You can click on a previous vote to “un-vote” and re-allocate elsewhere. DominoOne allows organizations to empower their members to prioritize, solve and activate solutions to any collection of issues or opportunities. 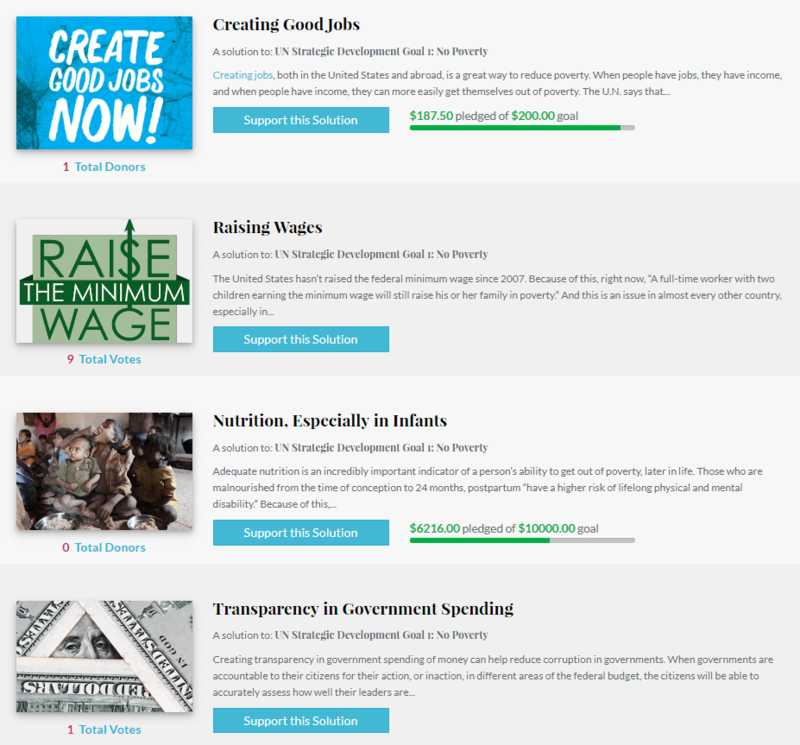 Individuals vote, share, improve, volunteer for and fund final crowdsourced solutions. 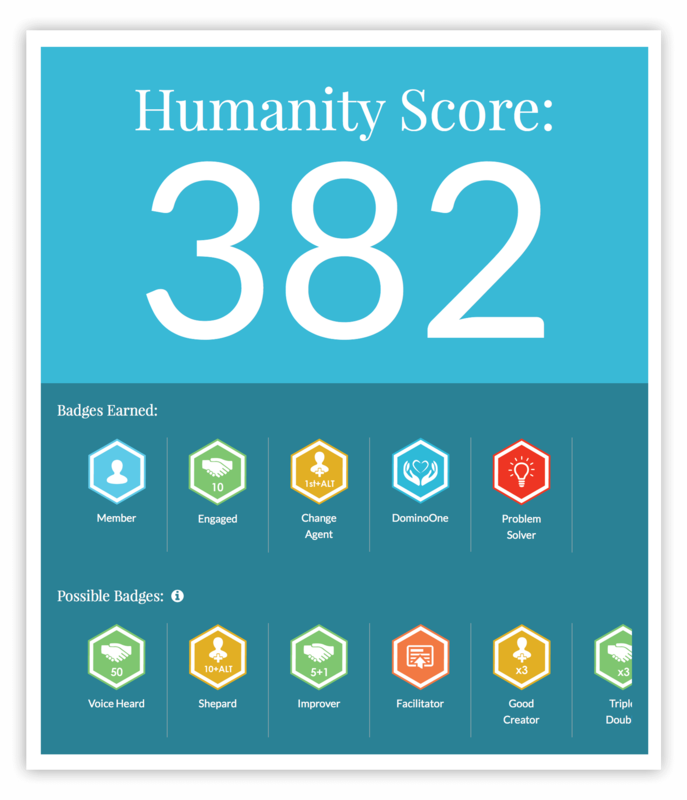 They can engage across different organizations and the platform rewards them with a humanity score representing their contribution to making this world a better place. © 2019 DominoOne. All rights reserved. Stay tuned. A big shift is coming.